When I was in class two, I participated in my first and last painting competition. The judging criteria was so biassed that I did not win the coveted competition. I used modern painting technology which included spitting on the chart paper, pouring coconut oil on the chart( my own version of oil painting) and even lighting up the edges of the chart paper to give it an ash effect. I did not even get the consolation prize. I never tried my hand in painting after that incident. My nephew "Jeremy", however is a great artist. He is not even three. But he draws and paints really well. He lives in his dream world with his dream characters,"pluto,mickey,minnie, winnie the pooh,dennis and calvin". 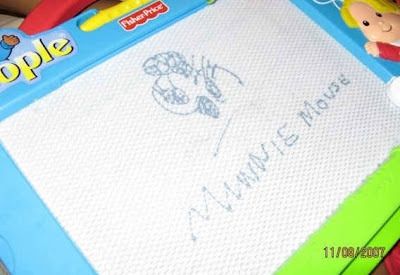 The picture on the left was his version of "minnie mouse doing the dishes". 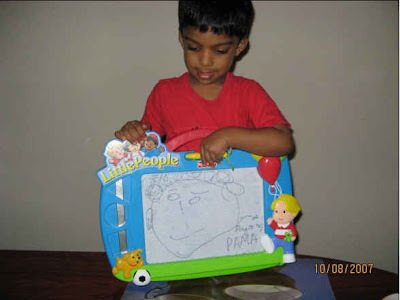 Gathering mighty inspiration from the little kid's work, me too tried my hand in drawing. But finally when I took the pencil and paper, I did not know what to draw. So I went ahead with my other chores and never bothered to draw. This is a picture of Winnie the poo. He drew this after I requested him to draw this one,cos my girl friend back in college had this nick name. Me being Christopher Robin, She became the Pooh.Coming back to Jeremy's drawing skills,he draws on the walls, on the floor,under the bed, ontop of his bed and even on Jolena's bums. On the contrary when I was three,all I knew was to pee in my bed. I am stressing again that I was three then.I used to eat chalk pieces and crayons. 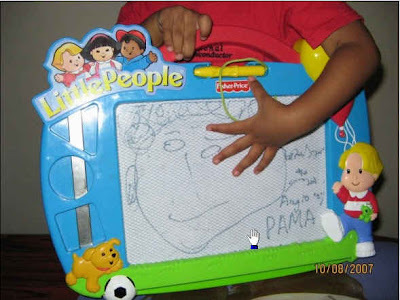 But little Jeremy even does amazing artwork on his potty too. Am not gonna explain it in detail, cos this blog does not entertaing gross-ness below a certain decree. His love for art and paints reached its pinnacle a couple of weeks back, when two buttons from the T.V. remote control went missing. They were later found inside Jeremy's crayon kit. My dad who is now on a vacation in the states has a great play mate in the form of Jeremy. They play basket ball and soccer together. Last week my dad took Jeremy to the lawn courts to play some strokes and they ended up paying a huge sum to an angry old man. Jeremy's raquet made contact with the rear view mirror of a car and that was the reason for the huge sum. So after giving much thought, my dad decided that taking the little one outdoors would cause serious trouble and hence resorted to some indoor action, with some brain wave games. But being a hyper active kid, Jeremy had other ideas. So after a long meeting the grand-dad and grand-son settled for a common game that would not harm anyone. Drawing is the name of the game. So Jeremy was back in business and he started drawing his favorite characters. But as they say, too much of honey is bitter; little Jeremy soon got bored with this drawing game and wanted a change in the game plan. He called in for a meeting with my dad. So the gran'pa and the grandson sat for another round of talks and this time, my dad came up with a new plan. The plan was a challenge for Jeremy. 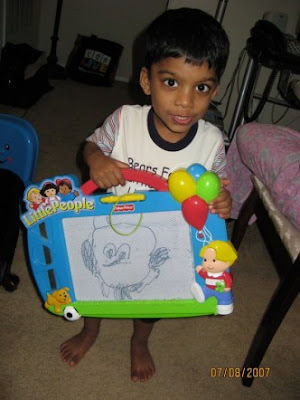 He had to draw my dad. Soon Jeremy got in to his act. My dad was lying on his back just like kate winslet's great titanic pose. Jeremy became a " Jack dawson" and soon he was in his elements. After one hour of hard work, my dad sprained hs neck due to lying down in that awkward position. Jeremy too had his master piece ready. Hey little one! You do draw really well. Did Jeremy really draw that or was that u ??? u had a girlfriend in college? does jeremy hav a girlfriend? jeremy is cute..and talented..you sister must be really bright cos obviously his uncles genes have not been passed on..this is based purely on what you say about yourself! !i'm no one to judge cos i cant draw!! me in india.. jeremy is SF.. poles apart..
Creative guy......like me .i was wandering did i u use to do it at such an early age? 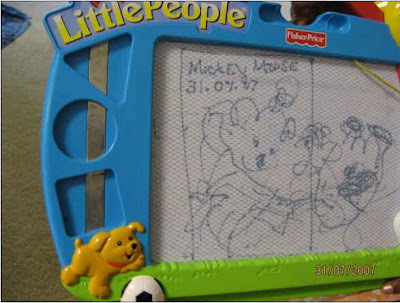 Kids these days are way too talented than how you and I were when we where their age ! Jeremy is no exception and dad's Kate-like pose was awesome ! Hey Chriz, how come u didnt piss on ur artwork too?